Tuesday afternoon I took a trip to Manchester for a meeting at the STA travel shop to pursue my dreams of going to Australia but as I had a few hours to spare I decided to take a small shopping trip to The LUSH store in the Arndale. I was searching for a good face mask for a reasonable price which offers fresh ingredients instead of those awful £1.00 sachets that you can buy from Superdrug which leaves my skin irritated and worse off than it already began. After being in LUSH for a good 5 minutes a sales assistant came over to help me decide which face mask would be best for my skin and the result I’m after. I wanted a face mask to cleanse my face as I wear make- up most days, without it being too harsh as I have very sensitive skin. 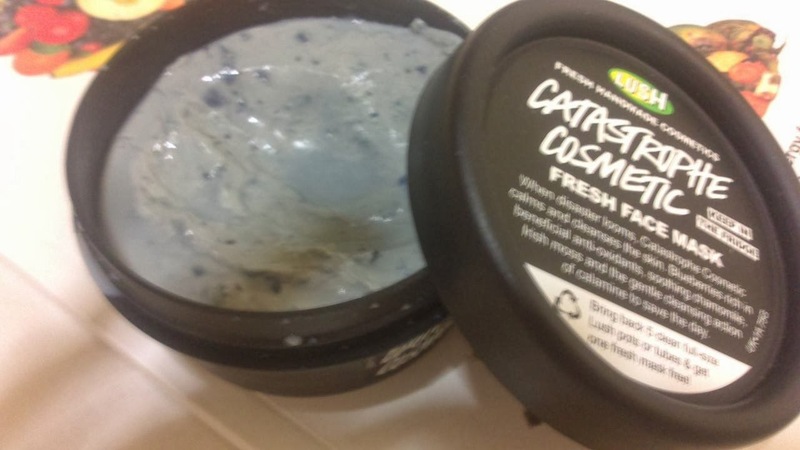 I purchased Catastrophe cosmetic for £5.95-The quote on the pot reads, “When disaster looms, Catastrophic Cosmetic calms and cleanses the skin. Blueberries rich in beneficial anti oxidants, soothing chamomile, Irish moss and the gentle cleaning action of calamine to save the day”. The sales assistant explained I will be able to get around 5-6 face mask applications out of the tub and keep it in the fridge due to the fresh ingredients. Also after I have 5 empty tubs I can trade them in to receive a free tub of fresh face of my choice. Last night I finally had some me time before bed so I decided it was the perfect opportunity to try my new product. Firstly I made sure my make- up was fully removed so the mask could work its best and cleanse my skin. I only needed literally 2-3 small blobs of the mask as it covered very well due to the thick texture. As soon as I opened the pot, I could instantly smell the blueberries which I absolutely love. I left the mask on for a good 10 minutes and then used cotton pads and warm water to remove the mask. In terms of results I noticed my face instantly felt softer and brighter looking which is always a plus. I think with persistence this mask will gradually improve my skins complexion each time. 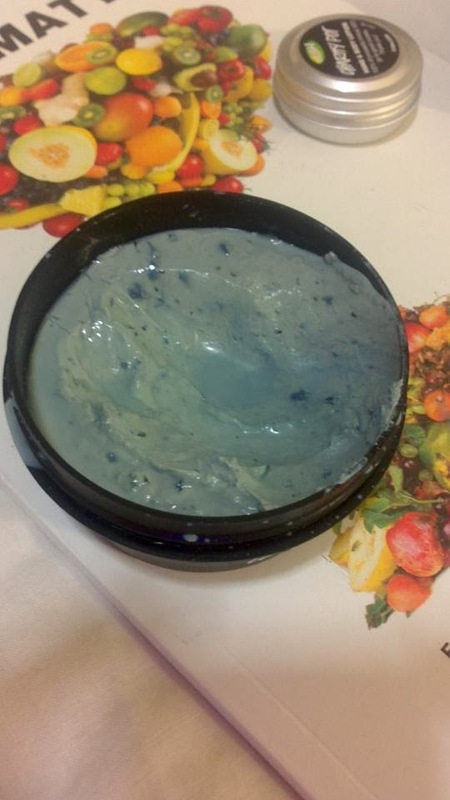 I was advised to use this mask every 4 days as using it every few days could dry my skin out. For the price it is amazing considering other brands who use natural ingredients such as Neal’s Yard are literally double the price. I also purchased a sample size of the Charity Pot which is a hand and body lotion. The woman had been so helpful; I felt the need to donate a small fee of £1. For every pot bought, except V.AT the money goes to different charities. I don’t usually get dry skin but yesterday my hands felt dry, due to the cold weather so I used a very small amount on my hands. I have to say this was a god-send my hands felt refreshed and it’s great for putting in your handbag.It’s heavily scented with cocoa butter which always smells delish. 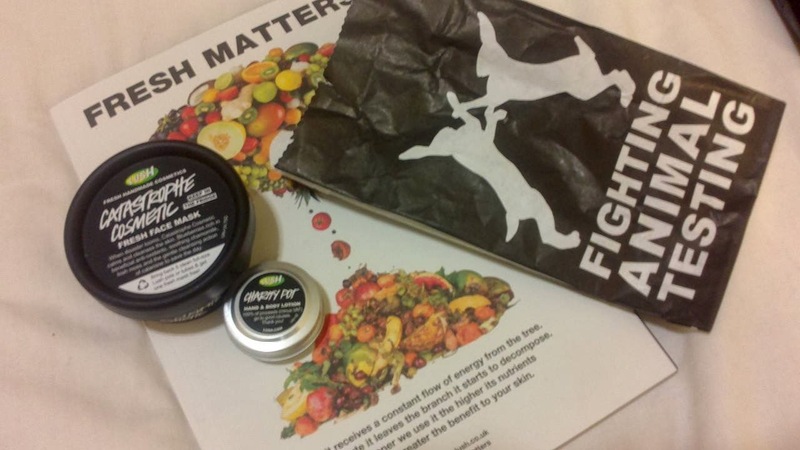 I’m definitely taking another shopping trip to LUSH in a few weeks time to stock up on some more of their great products. I had only used their soaps since yesterday but now I’m hooked on this brands products and views towards animal testing. What’s your favourite LUSH product?